Noida: The first ever food festival –“Khao Khelo or Khisko” was organized by the AAFT School of PR Events And Advertising at Marwah Studios on the occasion of colorful festival of Holi. Large number of stalls for food, games, music, dance , singing converted the whole area into creative ground. “never seen such a variety of food in this campus- every taste is available from street food to the formal dining, from burgers to pizzas, from Indian cuisine to Chinese, Italian, I think it could not have been better,” said Col. Pradeep Gupta Director of the School. 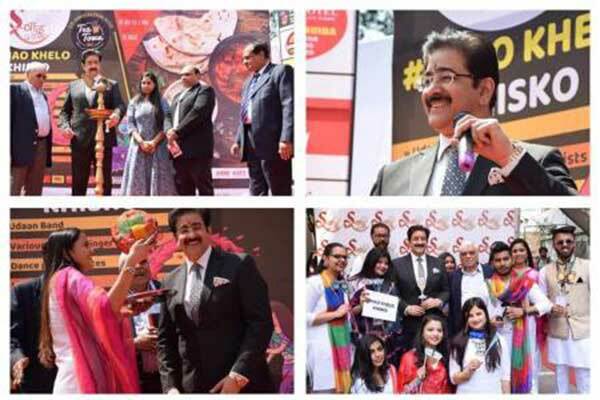 Dr. Sandeep Marwah President of AAFT University of Media And Arts, who was also presented with a Rajasthani Cap and plate of colors, inaugurated the event. ”I extend my heartiest congratulations to every one here on the occasion of Holi. Let our life be happy and colorful like Holi colors. Make it a point that you should be available for help for others. Do one good act a day. It is the time to bring love peace and unity in the nation through art and culture,” said Dr. Marwah. The fair lasted for the whole day and students from school of Cinema, Mass Communication and Journalism, School of Animation, Hospitality and Tourism, School of Fashion and Design, School of Performing Arts participated wholeheartedly informed Albina Abbas Dean School of PR events and Advertising.